A woman from Kelowna, Canada, has recently won pretty high amount of money when she played blackjack in one land-based casino. But the matter is that in a very short period of time all her winnings were stolen on her way to home. The lucky and at the same time unlucky woman was knocked by a quite young thief not far from her place of living when she was returning home from the casino she gambled in. The thief went away with the woman`s purse. The amount he had managed to steal was $6,000 in cash. 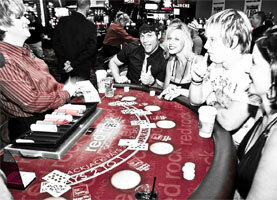 The money was received as a result of the woman`s winning at blackjack game. Police tend to assume that the thief was following the woman home from the casino she played in. He could notice that she had won big and decided to gain profit. The thief left his footprints and some hair at the scene of the crime that will be used by police in order to catch the thief. The husband of the victim hopes that this accident will serve as a great example for many casinos which still pay out in cash rather than by check. This situation has also provoked a lot of discussions among online blackjack casinos players who tend to think that the woman could avoid such situation in case if she played in online casinos.